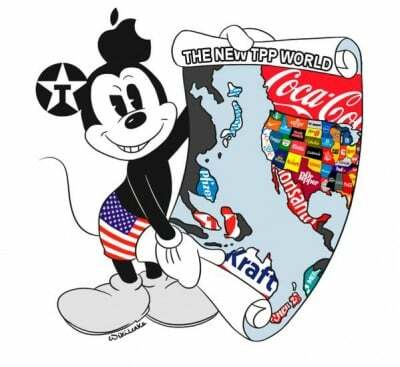 As of 5 October 2015, a super-secret 12-nation treaty called TPP is set to be signed by the 12 nations, and the terms of this massive international contract will be kept secret until the contract has been in force for four years, at which time the contents might (but won’t necessarily) be revealed. This will be a large new international government that has been negotiated for years by international corporations, and which is now to be rubber-stamped by corrupt politicians on their behalf. Whereas those international corporations know the contract’s terms, the people who elected and are ruled by those politicians don’t, and (for four years, at least) they won’t. The reason why the publics in these ‘democratic’ countries will not know until four years have passed under those secret terms, what their government had signed to, is that their government will have signed to allow international corporations to sue their government (those taxpayers themselves) for potentially crippling sums, not in a court of law in a democracy to which the public had elected the judges or had elected the people who had appointed the judges, but instead in a panel of, typically, three ‘arbitrators,’ who will be selected in accord with something called the “ICSID Convention”; and “the ICSID Convention provides that the majority of arbitrators should not be the nationals of the parties having dispute” — in other words: most of the arbitrators will be foreigners; all but one of the arbitrators will be chosen by international corporations; and, even the one arbitrator who isn’t, won’t necessarily be chosen by one’s own country; but, in any case, no more than one of the arbitrators can possibly be selected by one’s own country. If the non-corporate arbitrator happens to be selected by a foreign country, then one’s own country will not possibly be represented at all in these proceedings, which might set fines that will cripple the sued nation, and that might enormously enrich the suing international corporation. This will not necessarily mean that the fine, if any, will be higher than it ought to be, but simply that there is no democratic accountability in the process of determining what, if any, fine will be imposed upon the sued country.